We support many charities of which the one listed below is our highlighted charity that needs immediate attention. 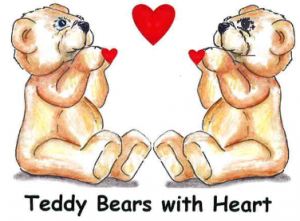 Teddy Bears with Heart is a charity based in Seaside, CA whose mission is to provide comfort to children and lonely seniors who have been abused, traumatized or hurt. Teddy Bears with Heart does so by providing teddy bears to first responders (EMTs, firefighters and police) and agencies that work with children/people in crisis. We here at MAS Distribution have partnered with Teddy Bears with Heart to become an official drop off location for anyone who wishes to donate to this wonderful organization.